Chuck Greaves writes the Jack MacTaggart series of legal mysteries (including Hush Money, Green-eyed Lady, and The Last Heir, all from St. Martin’s Minotaur), and as C. Joseph Greaves he writes historical/true-crime fiction (including Hard Twisted and Tom & Lucky, both from Bloomsbury). 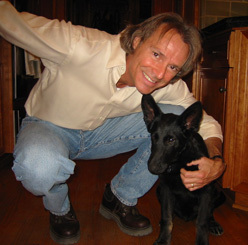 He is a past recipient of the SWW Storyteller Award, and has been a finalist for numerous national honors including the Shamus, Audie, Reviewers’ Choice, and LCC Rocky Awards, as well as the New Mexico-Arizona, Colorado, and Oklahoma Book Awards. His latest novel, Tom & Lucky, was a Wall Street Journal “Best Books of 2015” selection. Chuck also writes the monthly book review column for Colorado’s Four Corners Free Press newspaper. The death of a champion show horse lures attorney Jack MacTaggart into a tangled web of blackmail and murder in which he becomes both the prime suspect and the next likely victim. In Dust Bowl Oklahoma, a homeless man and his 13-year-old daughter are befriended by a charismatic drifter who lures them both to Texas where he murders the father and kidnaps the daughter on a one-year crime and killing spree across the American Southwest. Based on true events.